A BRIEF REFLECTION before commenting on what, from my perspective - very mine, very personal, very subjective- was the staging that Ópera de Puerto Rico offered us last Thursday and Saturday of the famous "Tosca" - one of the emblematic works of the Italian Giacomo Puccini, which was originally scheduled for October of last year and which, due to the passage of Hurricane Maria, had to be postponed until now. Texts like this one - which attempt to articulate a critical judgment on a specific artistic production - are in reality nothing more than the fruits of highly personal opinions of those in charge of this responsibility in the media world - from those that overflow with praise, to those that do not skimp on the description of mistakes, with all possible chiaroscuros between them. The happiness of the luminous reviews is exactly the reason for the thorniness of the grim criticisms: their permanence in time through the written word and the effect they usually have - for better or worse - in those who participate in projects that, in the reality of our artistic world, are usually gestations of epic proportions that demand considerations that transcend objectivities. But I reiterate: those of us who write texts like this, only express our opinion and not a universal truth and much less an objective one. Making opera in Puerto Rico - like the ones that for decades has produced Puerto Rican Opera, for example - is undoubtedly a feat whose difficulties have been escalating in proportions for several years, with a marked difference between those somewhat distant times when there were two productions every year with fully sold out performances and imported luminaries with fees in accordance, in contrast to the circumstances that have become normal, with only one annual project, great difficulties to recover the investment at the box office and cast of stars - many of them boricuas - who, although with international careers, have more modest caches. I recognize that the public does not have to know this when they come to enjoy - for example - a work like the one that Ópera de Puerto Rico has just presented. No, it is not mandatory that you know ... but it helps to understand how quixotic are those who continue to keep this art alive in our halls despite everything ... despite the fiscal crisis, the decline of the operatic public, the difficulty to renew those audiences ... in short, variables of an equation whose complexity has never intimidated those on our island who produce opera and neither those who choose it as a way of life. 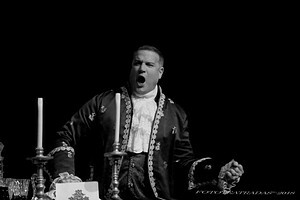 I write now of the "Tosca" that I witnessed last Saturday -always with the backdrop that I have just outlined- a brief opinion of what, I believe, was a great success both vocally and musically, as well as - given the circumstances in regard to production - with a commendable semi-staged version designed by Gilberto Valenzuela and the collaboration of Alfonsina Molinari and Lonka Álvarez-, with the orchestra on stage, some accessories instead of scenography and the pit enabled for the entry and exit of several of the characters. The soprano Yalí-Marie Williams gave life to an absolutely credible "Floria Tosca", not only through that exceptional voice that she has managed to maintain in optimal conditions despite the slowing pace in her professional schedule, but also through the histrionic intensity with which he navigated the different nuances of the character: the diva in love, consumed by the sickly jealousy with which she almost suffocates the painter "Mario Cavaradossi", the wounded and indomitable lioness that faces the abhorrent "Baron Scarpia" to death. Without excesses, with pristine phrasing and somewhat dark vocal brilliance, Yalí-Marie crowned her "tour de force" with a final scene as tragic as it was memorable. For his part, the tenor Rafael Dávila embroidered a wonderful and very neat "Cavaradossi", who skillfully and quickly overcame the problems of "tempi" of his initial "Recondita armonia" - a bit hasty, perhaps - to establish ownership without problems of a role that has become one of his most accomplished, with a voice somewhat enriched by maturity and an acting capacity with which allowed to project himself comfortably as the beleaguered artist harassed by a jealous lover, who subordinates his own safety to fidelity towards the fugitive friend. His "E lucevan le stelle" and his duos with Yalí-Marie -particularly those of the first and third act, just before his execution- were imbued, not only with a great vocal technical mastery, but also with a solid interpretative vein. Ricardo Lugo - as the "Sacristan" - once again demonstrated why he has our best bass for many years now, while José Ramón Torres - as "Spoleta" - worthily added a new page to his history as an almost inevitable presence in our operatic productions for several decades. Luis Alvarado, Christian Laguna and Camila Otero fulfilled their complementary roles. The adult choir - prepared by Jo-Anne Herrero - and the Children's Choir of San Juan - by María Alejandra Fernández- demonstrated fully the choral quality in Puerto Rico. And last but not least: the Puerto Rico Symphony Orchestra responded with empathy to the baton of maestro Maximiano Valdés - its titular director - with an adequate balance that without eclipsing the voices eloquently projected the beauty and drama of this immortal score. And yes, doing opera in our country like the one made by Ópera de Puerto Rico is a feat that deserves our full support.